Standard curtain panels can look more luxurious than they are. Earlier this year I moved into a new apartment that’s comfortable enough to stay as long as I like. The windows are relatively large and needed curtains. In my former house I had custom draperies made to my specifications and professionally installed. For the rental it was practical to opt for ready-made linen curtain panels. Installation was a DIY project accomplished with the help of a carpenter friend. I’m not the biggest fan of curtains and I had no experience with ready-made panels. In the past, I designed curtains, purchased material and had the workroom measure, make and install them. The curtains were wonderfully full and just grazed the floor for a luxurious, custom look. The linen ready-made panels I liked were flat, un-pleated panels sold in set widths and lengths. So my challenge was to make them look as luxurious and custom as possible. Basically, I had to figure out a curtain hack or risk having the curtains look skimpy. 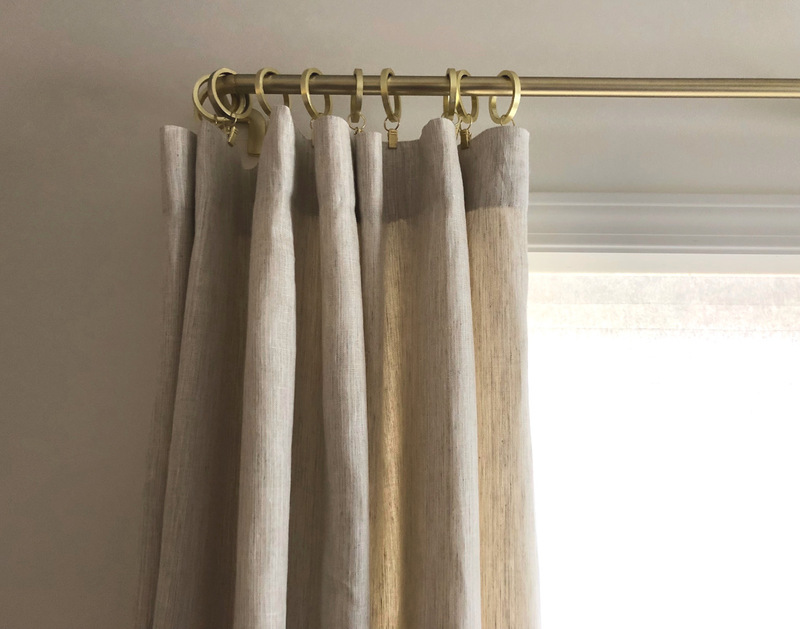 The big differences between custom and ready-made are the amount of fabric used for each curtain panel, lengths of panels, and whether or not there are pleats — pleating adds fullness. 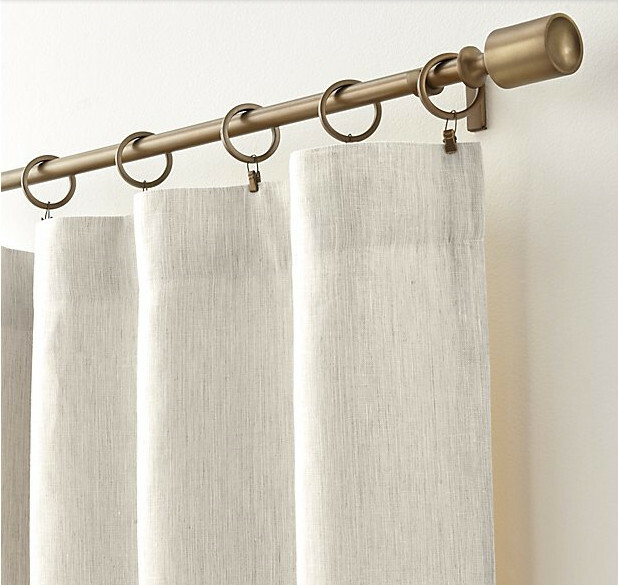 The panels I chose (at Crate & Barrel a longtime favorite source for quality and value) were un-pleated, lined linen panels with loops on the back for rod pocket (gathering them directly on the curtain rod) installation. The curtains come folded in plastic packages which also means they would need to be steamed out or steam-ironed before they could be hung (linen does not hang out well). I found that totally annoying. As with most store-bought panels, the widths are standard and a pair of 50-inch wide panels were the best choice for my 42-1/2 inch wide windows. That left me with two choices on the length. I could either go with 84-inch long panels to be installed with clip-on rings, or buy 96-inch panels and shorten them myself. I have shortened unlined curtains but shortening a dozen lined curtain panels was not an option. 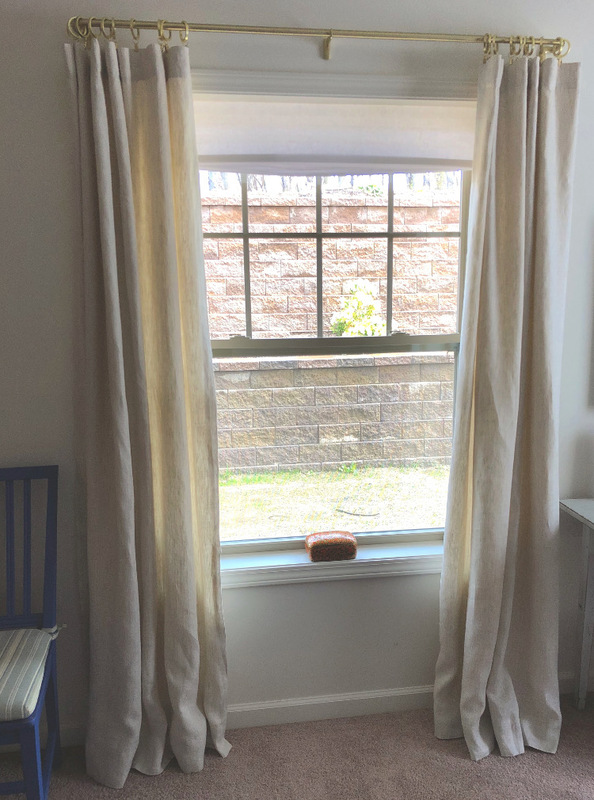 As a general rule, most curtain rods are installed 3 inches above the top of each window molding and they extend 3 inches beyond each side of the window molding. The top of my window moldings to the finished floor measured 83-1/4 inches. Then I needed to add 3 inches to the center of the rod. That came to 87-inches. So the curtains could not be gathered on the rod or they would be 3-1/2 inches off the floor — way too short. I don’t even care for them 1-inch off the floor — as the C&B website shows [previous photo] — because that makes them hang flat against the wall. Using rings with clips was clearly my best solution. Clip-on rings added 3-inches in length — 87-inches. Just the right height. But that still left me with a flat look when I held it all up in place. So here’s the hack: I hung the rods 2-1/2-inches above the top of the window frame instead of 3-inches. Visually there was no difference at the top. However, that extra 1/2-inch in length allowed the curtains to break just a little harder on the floor. And my adding 3 extra rings to each panel (7 are standard) I could simulate pleating at the top. 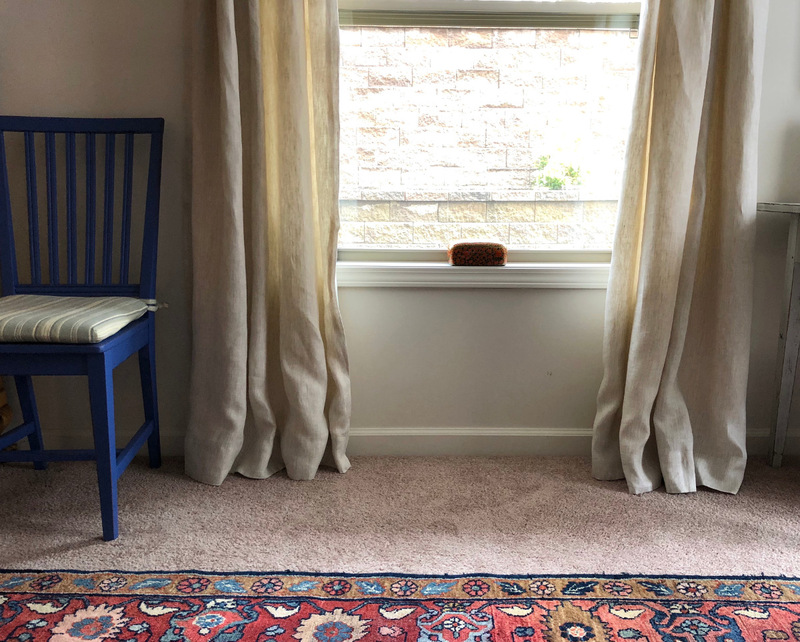 While my curtains are less than perfect, in large part due to my less than expert ironing skills, they gave be the slightly billowy look I was after on all my windows with little extra expense. I’m so glad to see yo back! I hope I have not missed much. I will go through older posts. Great piece about making curtain panels look lush. Thank you. Jane: Does your rod curve around at the ends? I can’t quite tell? And, another question: what would you recommend for bringing the rod out from the wall more than the standard 3″? Our bedroom windows have white Plantation shutters on the windows, with lots of white woodwork attached to the window frame. Without looking at it right now, I would say we need 5″ out from the wall for the curtains to just skim the front of the shutters. Would you put a square piece of wood, paint it to match the walls and minimize the look, and attach rods to that? I’m just beginning to redo the bedroom and we really do want curtains in front of the shutters and all that woodwork. Many thanks! Yes, Libby. Those rods curve at the ends. I hate light gap on the sides and the curved ends help the stack back as well. It’s hard for me to say how curtains should be hung without seeing the window, the rod choice and the curtains. F.ex. pinch pleated curtains will be fuller. 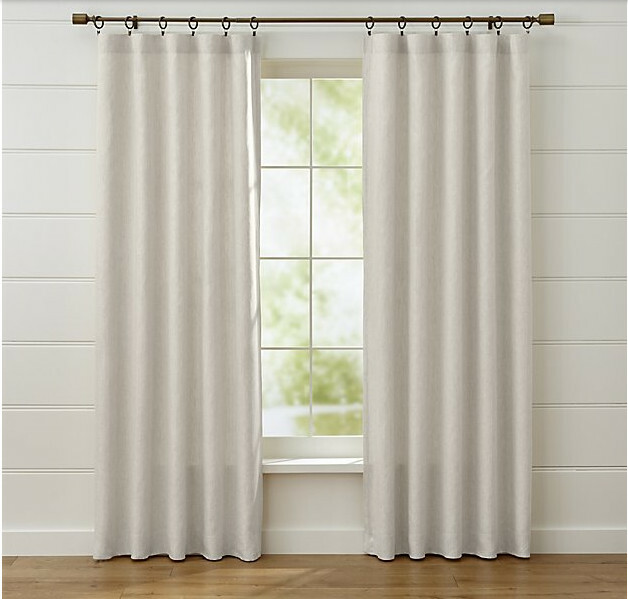 I feel curtains should just cover the side moldings, which 3″ usually does. Are your plantation shutters mounted inside the window frame, at the front or on it? That can make a difference. Do the curtains have interfacing at the top? I make all of my own curtains and drapes and had not considered interfacing the top, but it looks like this makes the top stay straight and not sag. The last drapes I made were silk velvet, and interfacing at the top would have made them too bulky, but I did use rings at the top like you did. I really like your use of linen, but the last time I made linen drapes, the sun made the fabric deteriorate after a few years. If you do not get too much sun, that will not be a problem. BTW, I’m in Westchester CA now instead of Venice. Lars, so good to hear from you! Such a long time. These are ready-mades from Crate & Barrel. Came folded grrr. I had to iron them. The drapes are lined with cotton but no buckram or interfacing as they are completely soft. The rod pocket is not solid as some are. It’s open and the verticals are spaced so panels stack back fairly evenly. I bought the rings with clips. Not my fave. I could do pins if I wanted to shorten them slightly – hooks could hide the clips. But they are working very well with the clips and the hardware looks much more expensive than it was. No sagging I think because panels are not heavy and installed to touch the floor.